For the descriminating bassist who demands supreme playability with remarkable craftsmanship, this is a dream instrument. 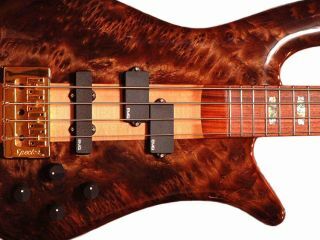 Stuart Spector Designs Ltd is offering a very special limited edition of handmade Spector basses. These instruments are handcrafted in the Spector workshop near Woodstock NY and will be limited to an edition of 24 pieces. The body wings on these neck- thru body basses are carved from rare water cured redwood burl. This wood is derived from the stumps of redwood trees that were cut down 100 years ago in northern California. These stumps were completely submerged in rivers for the last century and have recently been salvaged and obtained by Spector. The flow of the river water for such an extended period deposited minerals that have hardened the wood and deepened the color to a rich chocolate brown. In addition to this, all the sugars have been washed out of the wood, enabling drying to be done in the same fashion as the traditional preparation of violin woods. Each instrument will be accompanied by a special certificate signed by Stuart Spector which explains the special nature of the bass and lists its place in the Limited Edition line. The bass requires our clear high-gloss finish, and will deliver four-six months from month of order. A truly marvelous item that lists for $5,999.00 U.S.